ANCHORAGE, Alaska (AP) — A popular tourist train derailed Wednesday in southeast Alaska, and nine people suffered non-life-threatening injuries, officials said. The derailment occurred during the afternoon run of the White Pass & Yukon Route tourist train, which goes from Skagway, Alaska, into Canada. There were few immediate details of what happened, but railroad President John Finlayson said the train derailed as it reached the White Pass Summit. The derailment involved two vintage locomotives and four passenger rail cars, the company said in a written statement Wednesday night. The National Transportation Safety Board was informed of the accident, but it wasn't immediately clear if rail safety personnel would investigate, state officials said. Medical workers went to the scene, where responders outnumbered the injured, said Jeremy Zidek, a spokesman for the state Department of Homeland Security and Emergency Management. Initial reports had as many as 12 people injured. 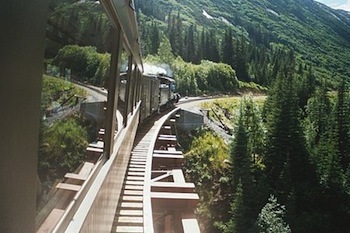 (The full text of the article was published on July 24, 2014 by API, at http://bigstory.ap.org/article/minor-injuries-after-alaska-tourist-train-derails ). The personal injury law firm of John J. Malm & Associates has been retained to represent one of the injured train passengers, who is an Illinois resident. She and her husband were aboard the train as passengers on a day-long vacation tour. The woman suffered back injuries, including a fractured vertebrae, and underwent surgery. She will require a second spinal fusion surgery in the future.